Cholesterol is a waxy, fat-like substance in your body. Your body uses it to protect nerves, make cell tissues, and produce certain hormones. Your liver makes all of the cholesterol your body needs. But you also get cholesterol directly from food you eat. Common sources include eggs, meats, and dairy products. This can add too much cholesterol into your body. That can have negative effects on your health. Luckily, there are a number of lifestyle changes you can make to improve your cholesterol. Low-density lipoprotein (LDL). This delivers cholesterol to the body. This is called “bad” cholesterol. You want a low level of this type. High-density lipoprotein (HDL). This removes cholesterol from the bloodstream. This is called “good” cholesterol. You want a high level of this type. A high level of LDL is bad for your body. Likewise, a low level of HDL is bad for you. If your doctor says you need to improve your cholesterol, you’ll need to lower your LDL and increase your HDL. Medicines can help with this. But the simplest way to improve your cholesterol is through lifestyle changes. What lifestyle changes can I make to help improve my cholesterol levels? Exercise can raise HDL cholesterol levels. It can also reduce levels of LDL cholesterol and triglycerides (a type of fat in your blood). Try to work out for 30 minutes, 4 to 6 times a week. Make sure you talk to your doctor before starting an exercise plan. Being overweight can raise your cholesterol levels. Losing weight, even just 5 or 10 pounds, can lower your total cholesterol, LDL cholesterol, and triglyceride levels. Smoking lowers your HDL cholesterol. Even exposure to second-hand smoke can affect your HDL level. Talk to your doctor about developing a plan to help you stop smoking. Eat plenty of fresh fruits and vegetables. Fruits and vegetables are naturally low in fat. They add flavor and variety to your diet. They are also the best source of fiber, vitamins, and minerals for your body. Aim for 5 cups of fruits and vegetables every day. This should not include potatoes, corn, or rice. These count as carbohydrates. fats in whole milk dairy products. Limit the amount of saturated fat in your diet. Avoid trans fat completely. Unsaturated fat is the “good” fat. Most fats in fish, vegetables, grains, and tree nuts are unsaturated. Try to eat unsaturated fat in place of saturated fat. For example, use olive oil or canola oil when cooking instead of butter. Use healthier cooking methods. Baking, broiling, and roasting are the healthiest ways to prepare meat, poultry, and other foods. Trim any outside fat or skin before cooking. Lean cuts can be pan-broiled or stir-fried. Use either a nonstick pan or nonstick cooking spray instead of adding fats such as butter or margarine. When eating out, ask how food is prepared. You can request that your food be baked, broiled, or roasted, rather than fried. Look for other sources of Meats are good sources of protein. But they contain a lot of cholesterol and saturated fats. Fish, beans, tree nuts, peas, and lentils also offer protein, but without the cholesterol and fats. They also contain fiber and other nutrients. Consider eating one “meatless” meal each week. Try substituting beans for meat in a favorite recipe, such as lasagna or chili. Snack on a handful of almonds or pecans. Soy is also an excellent source of protein. Good examples of soy include soymilk, edamame (green soy beans), tofu, and soy protein shakes. nuts and seeds (such as ground flax seed). In addition to fiber, whole grains supply B vitamins and important nutrients not found in foods made with white flour. Eat more fish. Fish is an excellent source of omega-3 fatty acids. These are “good” fats that are good for your heart. Wild-caught oily fish are the best sources of omega-3s. These include salmon, tuna, mackerel, and sardines. But all fish contain some amount of this beneficial fatty acid. Aim for 2 6-oz. servings every week. Add supplements to your diet. Plant sterols and stanols. Plant sterols and stanols can help keep your body from absorbing cholesterol. Sterols have been added to some foods, including margarines and spreads, orange juice, and yogurt. You can also find sterols and stanols in some dietary supplements. Omega-3 fatty acids. If you have heart disease or high triglycerides, consider taking an omega-3 or fish oil supplement. Make sure the supplement has at least 1,000 mg of EPA and DHA. These are the specific omega-3 fatty acids found in fish. Red yeast rice. A common seasoning in Asian countries, red yeast rice may help reduce the amount of cholesterol your body makes. It is available as a dietary supplement. The recommended dose of red yeast rice is 1,200 milligrams twice a day. Talk to your doctor before taking red yeast rice, especially if you take a cholesterol-lowering medicine called a statin. Often, there are no symptoms telling you that you could have high cholesterol. If you have high cholesterol, your body may store the extra cholesterol in your arteries. This build-up is called plaque. Over time plaque can become hard and make your arteries narrow. Large deposits of plaque can completely block an artery. The plaque can also break open. This leads to formation of a blood clot that can block the flow of blood. If an artery that leads to the heart becomes blocked, you could have a heart attack. If an artery that leads to the brain is blocked, you are at risk of having a stroke. Many times, people don’t find out they have high cholesterol until they’ve had one of these life-threatening events. If you have high cholesterol, you are twice as likely to develop heart disease. This is why it is important to have your cholesterol levels checked, especially if you have a family history of heart disease. How often should I get my cholesterol tested? 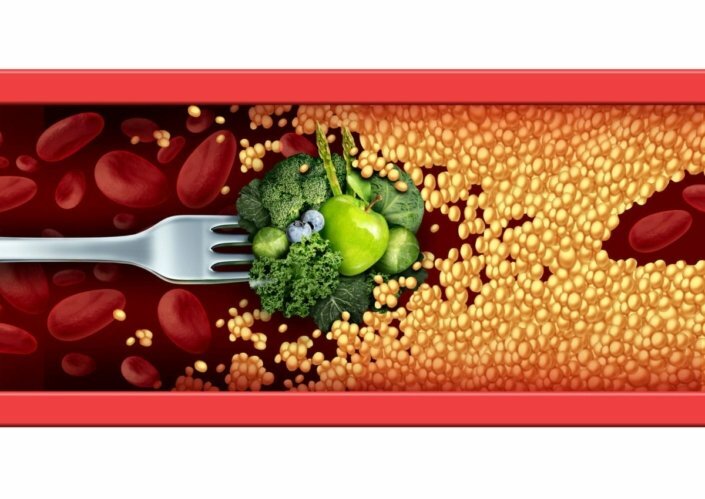 What are my cholesterol levels? What do they mean? What lifestyle changes do I need to make to help improve my cholesterol levels and heart health? Is there a chance that I’ll need cholesterol-lowering medicine? What are the risks and benefits of taking this medicine?